No-Marr Straps - Spartek, Inc. The team at Spartek is proud to provide premier injection molding services to clients across a range of industries. Recently, we worked with a client boasting more than 20 years of experience in the injection molding industry themselves. The case study below delves into the details of this particular project, illustrating the depth of our expertise in even the most demanding situations. The client, NoMarr Strap, a division of Kena LLC, is an injection molding manufacturer of adjustable, expandable straps for material and equipment securement applications. 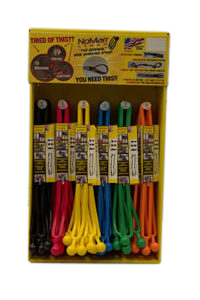 NoMarr came to us in need of injection molded flexible vinyl fastening straps for use in home and outdoor applications. These straps would be delivered direct to big-box stores, so all units needed to be of the highest quality possible. NoMarr also required a very high volume of these units — 1.2 million — and needed them within a strict deadline of 60 days. Tight color controls were required, and unmatched structural integrity was paramount. NoMarr products are specially developed to eliminate common pain points and ensure optimal ease of use. Their straps are designed to hold heavy objects securely in place without the risk scratching or otherwise marring surfaces, so we knew our units would be held to exacting standards. The team at Spartek got to work immediately, injection molding the components as requested, with close attention to color control and optimal structural integrity. Our team worked together to deliver a reliable solution. Our production coordinator ensuring all processes ran smoothly and top-quality materials were used, our molding manager keeping production on pace, and our production manager overseeing production and quality control. We made use of high-quality flexible vinyl to ensure the units would be able to hold up against even the most demanding loads. Through structural integrity testing and our stringent quality control program, we confirmed that the straps would be able to offer reliably high strength in challenging applications. Although we had no previous experience creating this type of part, our expert team delivered, completing the high-volume order within the client’s tight deadline. The units were shipped directly to big-box stores across the country, meaning buyer feedback and sales numbers would be the main quantifiers of our success. The results were stellar, and the client was very pleased. They’ve since put in a second order for the same straps, at a higher quantity than the first. No matter how demanding or complex the application, the Spartek team can handle all of your injection molding needs. To learn more about our past work or discuss how we can help with your next project, contact us today. We’re on hand to answer any questions you may have.